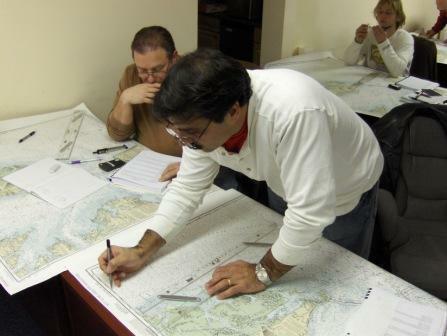 Joe O'Malley of Berrington,IL, & Luis Melendez of New York Waterway Taxi share their feelings on a charting problem. Graduating class pose for a picture. 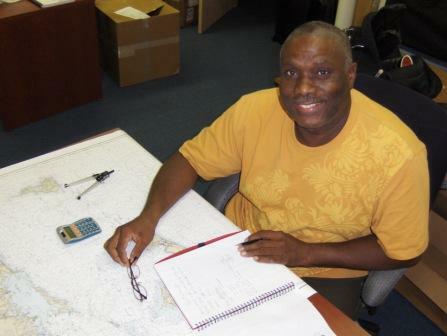 Captain-candidate Dave takes a moment from his navigation work on the Chesapeake Bay chart to smile for the camera. Paula easily navigates her way through the varied charting & plotting exercises. She has been a mariner since the age of 5! Nice job, Captain! Joe diligently works on his favorite part of the course. "Don't run aground, Joe!" 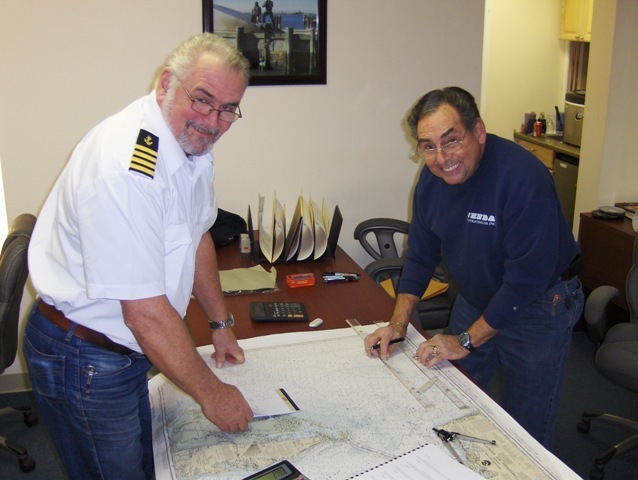 Instructor Captain Mike Donelon helps out Scott Braddock of Montauk, NY while working on the Long Island Sound chart. 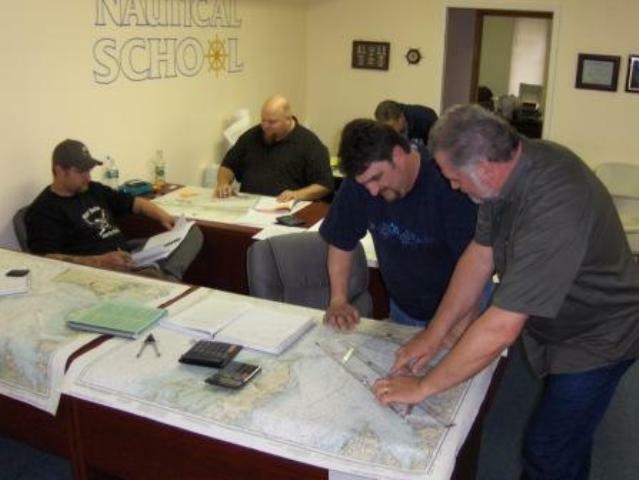 Captain Bill having fun with his class in the summer of 2010. One of the best groups. The chemistry and learning environment between you all made for great fun and lifelong friends! 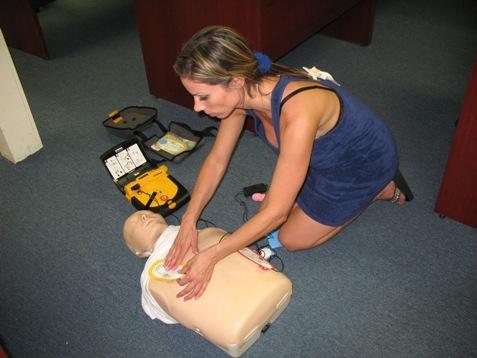 Jill at the Nautical School works on the Automatic External Debrilator while completing her First Aid and CPR requirements for licensing. 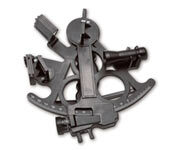 Jill is a USCG license captain. 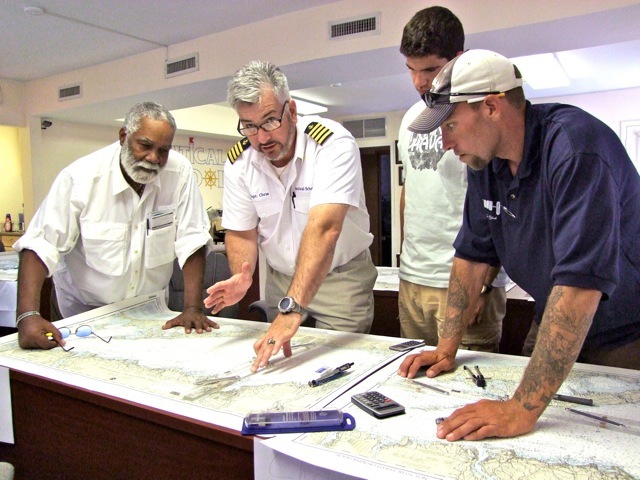 Captain Chris shows students the art of navigating on a chart by explaining a concept known as Set & Drift. 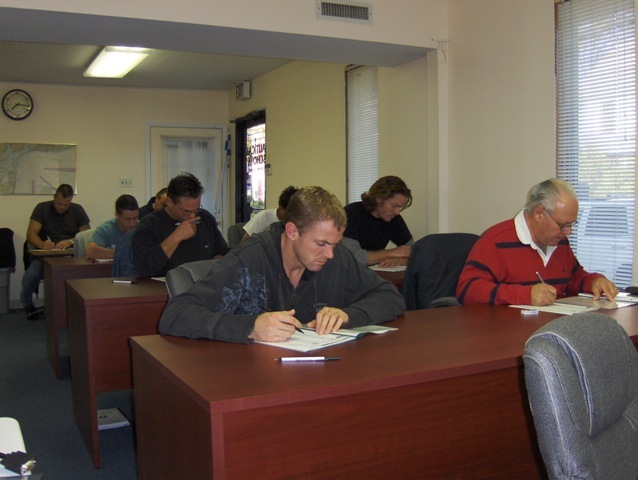 Candidates completing the examination for licensing at the Nautical School's headquarters in Long Island. 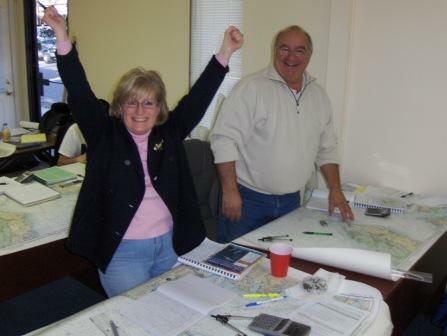 Pete and John have plenty of reaosn to smile as they BOTH "aced" their exams. 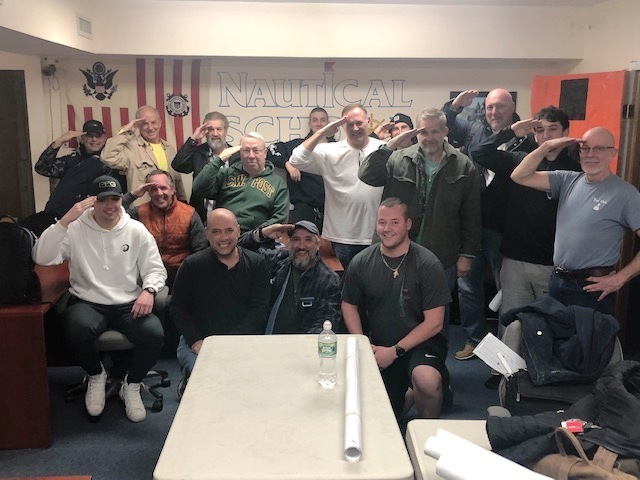 Two of the nicest candidates joined a wonderful group of students who took their course the week of November 15, 2014, and all passed their exams. Congratulations to all of you, WELL DONE! 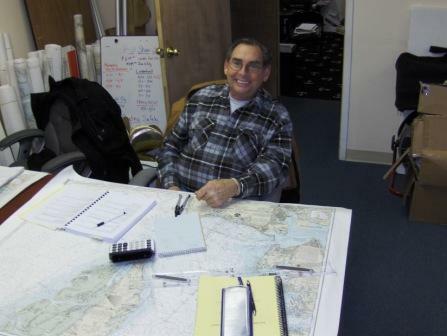 Captain Dave Weisberg takes a break from plotting his courses in the Block Island Sound to pose for a picture. Pam plots her way through dangerous waters without hitting any rocks while hubby Frank looks on! Capt. Mike privately tutors Dave wwho went on to pass his test and is now very proud of his captain's license. Nice work, Capt. Dave! 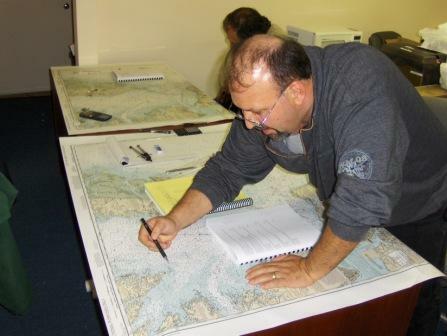 Robert Scarcello busy contemplating courses to steer while completing the OUPV course. 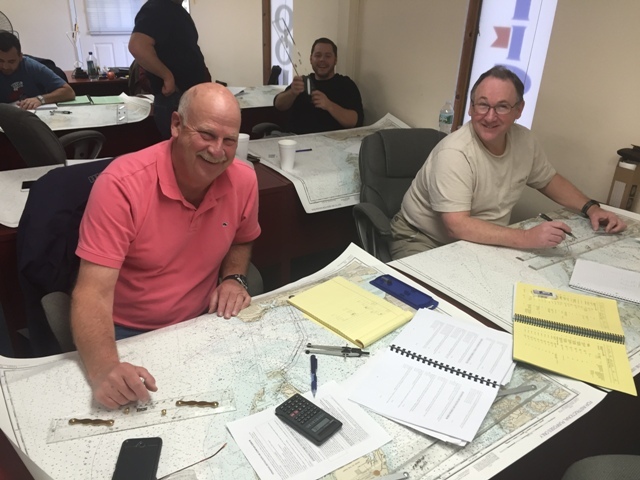 Bruno (left) and Joe Lennon (right) look up from navigating the Chesapeake for a quick photo. (Joe, you almost made the \"Wall of Shame\" part of this gallery session by calling the Chart the dreaded M-WORD! But, redeemed yourself with excellent test scores!